Welcome to the Town of Pamplico. The Town of Pamplico is located in Florence County and the Pee Dee Region of SC, along S.C. 51. We are conveniently situated approximately 30 minutes from the City of Florence and I-95/I20, 1 hour from Myrtle Beach, 2.5 hours from the SC mountains, 2 hours from Charleston, SC, and 1.5 hours from Santee, SC. Incorporated in December 1916, the Town now has a population of 1226 citizens (2010 Census). Once one of South Carolina's largest tobacco markets, especially during the 1950s and 1960s, Pamplico is now a quiet rural town that is home to one of the area's finest school districts, Florence County School District Two. The Mayor and Council are striving to make Pamplico an even safer and attractive town for all current and future residents, as well as a business friendly municipality. The Downtown Streetscape Project, pictured below, was completed in 2010 with grant assistance from the SC Commerce Department. The Town of Pamplico is a South Carolina municipality operating under the Council form of government. The Town Council is comprised of the Mayor and six Council Members. Council meets the third Monday of each month at 6 p.m. at the Council Chambers, 201 River Road. The Town provides the following services: police protection; water and sewer services; solid waste collection; and parks, recreation and tourism. Mayor Gene Gainey and Town Council recognized two long-time employees at their July 15, 2013 Council meeting. Ms. Joan C. Williams retired effective July 31, 2013 after 18 years of service as Utility Clerk. Also, Mr. Ervin L. Coleman resigned effective July 7, 2013 from the Pamplico Police Department to pursue another employment opportunity. Council honored both employees with a reception during the Council meeting. Click here to see pictures of the event. Francisco Arriaga, student at Hanna-Pamplico High School, was presented the 2013 Pamplico Youth of the Year certificate & medallion by Mayor Gainey and Ms. Alice Morrow of Boys & Girls Club, Florence, SC, at the May 20, 2013 Town Council meeting. Congratulations were given to Francisco by the Mayor and Council for all his years of being an A student and being a role model to his fellow classmates. Click here to see a picture of the event. Have your company name, website link, and email listed here for $7.50 monthly. The Town reserves the right to refuse any and all requests for advertising as deemed in the best interest of the Town. 1. The Fourteenth Annual Pamplico Cypress Festival will be held on October 5-6, 2018. For more information about our festival or to download Applications, etc., please go to our Cypress Festival Page. 3. The 2016 Full Cost Disclosure Report on solid waste management services provide for residential and commercial customers may be viewed and downloaded from our ﻿﻿Services Page. 4. Town Council meets 3rd Monday each month, 6:00 p.m, Council Chambers, 201 River Rd. 5. Business license renewal deadline is June 15 annually. 6. Utility bills are due by the 15th of the month. If paid after 15th, a 10% late fee will apply. Any bill that remains unpaid after 12:00 NOON on the 21st day of the month, will be assessed a NON-PAYMENT CHARGE OF $25.00 AND IS SUBJECT TO BEING CUT OFF. 7. Garbage pickup day is on Wednesday mornings effective September 18, 2013. Please place your cart at the curbside on Tuesday evening for pickup by Waste Management Inc. on Wednesday. 8. The Town has a leash law requiring that dogs be kept on owner's property. Roaming dogs are subject to pickup by Florence County Animal Control. 9. Pamplico Municipal Court (Judge LaVerne Ard) is held on Thursdays. 10. Outdoor burning of yard debris is allowed from sunup to sunset if approved by the Pamplico Fire Chief. A fire must be fully extinguished by sunset. 11. 10 & Under Tennis Camp See "Services﻿" page for more information. 12. 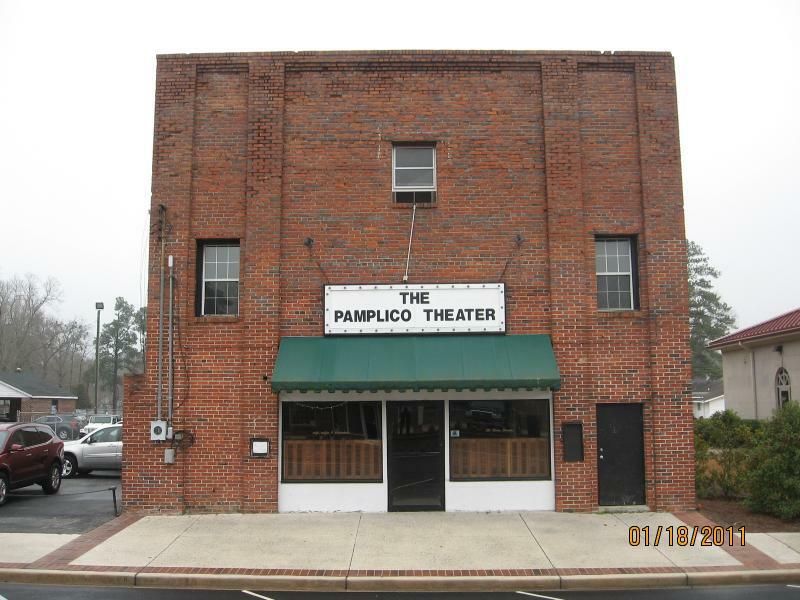 The historic Pamplico Theater needs renovating. More information is on our "Services" page. 13. For Sale Surplus Equipment shown on "Services" page. Call Town Hall at 843-493-5551 if you have questions. Thank you.